Most companies could be doing more for their websites to stay on top of search results, but it takes time and resources. Learn how C3D helped Methodist Health System overcome challenges related to local SEO and search engine marketing. To put things in perspective, Nebraska Methodist Health System is comprised of one corporate office, four major hospitals, 20+ clinics, and hundreds of doctors. Managing the location data for each of these "businesses" required technical expertise that Methodist's internal marketing team could not take on themselves. Doctors move, locations close, new buildings are constructed—but potential patients never stop searching! From an initial search query to the call for an appointment, the importance of accurate location data for a business like Nebraska Methodist Health System is paramount to a great customer experience on the web. To optimize this critical piece of their online presence, C3D identified a strategy for populating and correcting location data for all of the corporate offices, hospitals, and clinic locations. 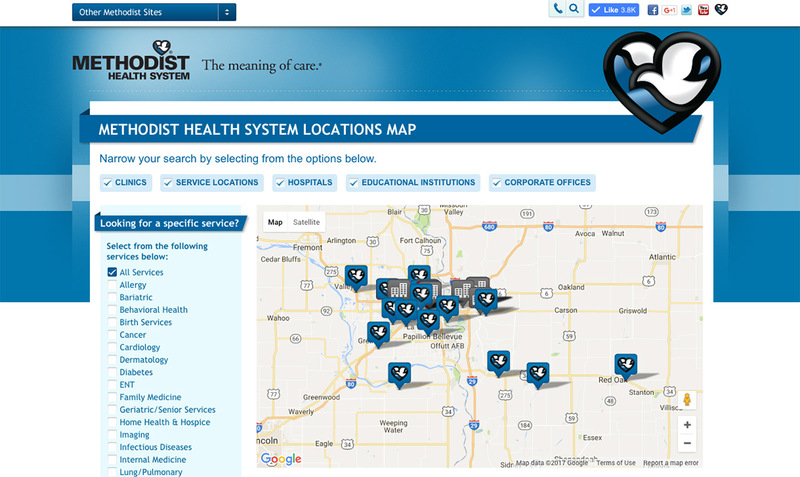 We started by guaranteeing the location data for Nebraska Methodist Health System’s corporate office and 3 major hospitals was correct on the primary directories that feed into major search engines. We went through and eliminated any duplicates that may have caused any confusion and deleted listings that were outdated. But, there was an additional local directory website that we noticed none of Methodist's locations were officially listed: Google.com. The accuracy and completeness of the information on a Google My Business listing is one of the strongest signals that determines whether or not your business is displayed in local search results. 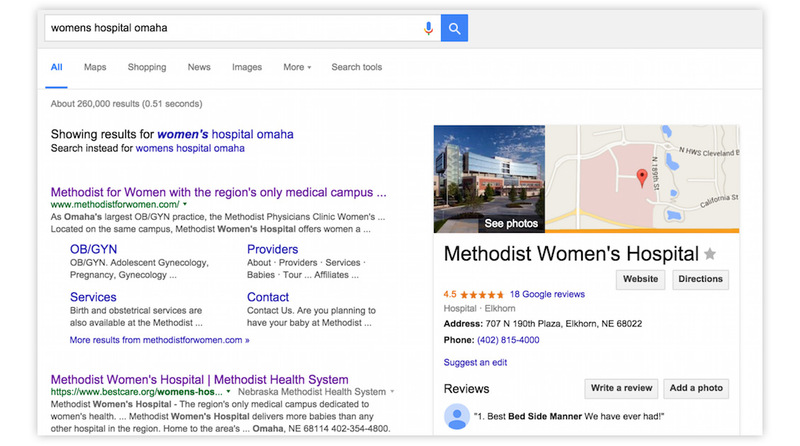 With verified Google My Business listings for each of their locations, Nebraska Methodist Health System can also drive organic traffic to specific landing pages to shape a customer experience directly from search results. This renewed focus on local search visibility and location data consistency provided a noticeable boost to the organic traffic on BestCare.org, with location specific pages receiving up to ~100% increases in daily pageviews since February 2016. Corporate Three Design also provided Methodist with an ongoing Google AdWords campaign for promoting healthcare services within specific areas around Omaha. Methodist ads show up based on keywords that are related to the services they want to market. For example, if a potential consumer was searching for a general physician in the Omaha area, a Methodist ad would show up at the top of the search results page. C3D provided the creative copy and budgeting advice to ensure success, resulting in an average click-thru-rate on Methodist ads of 3.71% vs. industry average of 1. 79%. Our SEO specialists are dedicated to understanding the intricacies of Google's search algorithm so you don't have to. Customized strategies allow us to identify the most impactful signals in your competitive market or industry and put them to work for your website.